Over at the blog of Costa Mesa's racist laureate, the Neanderthal misogynist who operates it provides yet another reason to steer clear of anyone with a surname beginning with "M" this election season. Yes, his surname begins with "M". In a recent rant - his #16 dated, 10/20/12 - he spends a lot of time berating women who support the opponents of his favorites, the 3 M's. He says, in part: "Well, we think that many of the women who oppose the 3Ms just don't like MEN. We further think that they then gravitate to sensitive (read unmanly) men." Now, if that offends you I certainly don't recommend that you wade through the reports on black on white crime around the world to read the entirety of his pathetic entry. If you follow the tone of his screed, ONLY women who choose to be dragged around by their hair by some clown carrying a club, wearing a saber-toothed tiger skin, are appropriate company for the 3 M's. That's right, only women who hang out with "real men" are welcome in the 3M camp. Don't believe me? OK - but you've been warned - read his crap HERE. After Jim Righeimer's despicable actions following the Eastside Costa Mesa Neighbors Group forum last Thursday evening where he berated several members of the organizing group - mostly women, by the way - in front of his young daughter, you get the idea that Mr. Neanderthal is probably right. It seems that only submissive women are welcome around their campfire as they beat their chests and gnaw on raw meat, straight from the bone. How very sad for our city that this throwback has even a few followers of his racist, misogynistic drivel. I have confidence in the Costa Mesa electorate. I know they don't buy the racist crap Mr. Neanderthal spews. They don't buy his pathetic essays that have made him the darling of white supremacists around the world. Former head of the Ku Klux Klan, David Duke, thinks he's a great writer - an endorsement Mr. Neanderthal proudly uses to market his books. It does deeply sadden me, though, that some of the current council candidates seem to have embraced him and his literary putrefaction - going so far as to include him, briefly, on their list of endorsers. There is some truth to the old saying, "You are known by the company you keep." If you want a municipal governance swayed by Mr. Neanderthal's vile vitriol, by all means - vote for the M's. If not, your choice is very simple - Vote For The Top 3 and No on V! To comment or not - I've been wrestling with this because to comment is to give him and his ilk credence. But I will say this, no "real man" is afraid of strong women. No "real man" believes he has to define a place for half the world's population. Small, weak and sniveling excuses for men who are afraid of - well, everything - have to try to control their environments and those around them. So who really cares what one insignificant excuse for a human thinks? There are two real men and one real woman of character and integrity that I support. 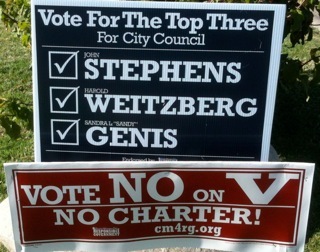 Stephens, Weitzberg and Genis for City Council. Yeah, Geoff, M number 5 talks a lot about manliness and testosterone and estrogen -- but he doesn't say diddly about the philosophy, morals, background, and probable destination of those socalled "manly types" who drink -- actually drink -- DIET COKE. I bet M number 5 probably indulges in this vice himself. The truly interesting thing to me, though, is that none of the four councilpersons whom I gifted with flasks of the finest domestic beer ever brewed -- Colorado Native -- has ever had the strength of character, or the courtesy, to open the bottle and taste -- and either say, "Thanks, pardner" or "Jesus, what lousy beer". Boy, am I glad I never tried to supply the fifth M with any of that fine, fine stuff. My comment at council about "No wonder there are so many massage parlors opening up, with so many misogynists on council" went right over their heads too, nor has M number five made any comment on it. Well, how can we expect intelligent comprehension out of our council if we elect people whose IQ compares unfavorably with that of a block of pinus pacificus? ocgop is racist? is that the point? It's hilarious that he (THEY or WE in his weak little mind) often resorts to kindergarten style name calling in his blog. OK, I admit that I read his blog from time to time for the entertainment factor similar to the Sunday comics. M's support for Mensinger, Monahan, and McCarthy is clearly enough for me to distrust them and Measure V.
Say no to racists and bigots. PS, Will the affect the mancrush he has on you? Kent Mora's first reason to vote for these 3 courageous M candidates is complete and utter hogwash. This is how those people play this game. There was no courage involved in this act. This was actually done to anger and create hate toward the city employees. Pure and simple. That is not heroic. Righeimer hates unions and associations of any kind when they are not in his camp. He thinks employees are all union thugs and thereof wants to destroy them as part of their association dues go to OCEA. To do this they have to create anger and hate amongst the private sector toward the city workers. In order for Righeimer and Mensinger to create this hate and anger toward city workers they had the salaries and pensions costs posted on the cities webpage. Not just the positions mind you but the personal names of those holding such positions. I am actually OK with part of that. I feel it is fair to show the city pays for each position. I am against the personal name attachments though. And I know this wasn't courageous as this total tool Mora says it was to divide the people and create anger toward the city employees these people want to destroy. I don't think Mora knows what courage is. He is just some puppet for the M group. I guess the good news is that his war against blacks, browns, and "wimmin" distracts his tiny mind from obsessing about Geoff. As the campaign manager for Harold, I have to exercise great discretion whenever I hear of him. The anti-Semite garbage is of a particular level of disgusting. name calling? happens on both sides, agreed? box cutters slicing signs and banners: done by union thugs no doubt about that. that's their style. the paintballs, who knows, kids/thug combo? Union thuggery must stop. The thought of them and sharp shiny objects is concerning. will they go farther when confronted? Please ask God to teleport Righeimer to a beautiful earth-like planet. If you think of it as the RIGmeister and his (B)Ms, it gives you a true visual of what, We, the People of Costa Mesa, have had to deal with!!! YUCK! We dont want these (b)ms on OUR CC; we've had enough of their excrement! As the (B)Ms go down the toilet, may their RIGmeister follow!! No to the (b)ms! No to this one man's charter! We will vote in true presentation of, by, and for We, the People of Costa Mesa! Stephens, Genis, and Weitzberg!! Did anybody else happen to see Fitzy putzting in his propaganda golf cart yesterday? What a complete A-Hole he is, not for driving it around, but for having the young girl, probably his daughter sitting right next to him, and NOT WEARING A SEAT BELT!!! I know there was talk about if the propaganda cart was really a golf cart or maybe a low speed vehicle, either way I wouldn't have any of my kids in one of those, out on those busy streets. Good job Fitzy, way to put safety before some lame campaigning for your lame drinking buddies. Trudy Ohlig-Hall has taken to her website to defend herself against specious charges coming out of Ethan Temianka one of the Righeimer minions. Just Google Trudy Ohlig-Hall. Temianka is a waste on the Parks Commission. He only received that appointment by Riggy because he was his campaign manager and it was simply payback. He not only should not be elected to the water district but he should be removed from the Parks Commission. Useless. GO back and watch some of the Parks Meetings. You dont want this guy on the Water District Board. "specious charges coming out of Ethan Temianka"
Baby Ethan's a punk and a Rig-thug just like the others. He's still in the womb though. Last time he spoke at council he couldn't read his script properly and came off as a doofis. If you are going to stoop low enough to allow comments about Fitzpatrick's children, demand that the poster use his or her real name. That cart is street legal and has seat belts. What a bunch of low life scum bags you host here. I hope that you are proud. I saw this earlier. Too dark in the beginning for me to indentify anything about the person. Did you file a police report? Is the guy (?) taking the signs the same person walking the dog? Where was this video shot? What time of the night? @ disgusted--- having seatbelts and using seatbelts are two different things.Why you so angry about this? All they did was post what they saw. YouTube title--"Costa mesa man stealing and destroying political signs". Is that $500 reward being offered by the Police Dept. or Jimmy Fitzy? Seems Fitzy or whoever posted it is serious about this, so serious that that they put their phone number and email. Now that I look at it , I don't think it's Fitzys email, well maybe, what do you think--JimFitzEco@gmail.com? That must've been a killer stakeout with Fitzy. He and Howard and Kent must've all got together, maybe borrowed a few toy badges and an iPad from Mensinger. How'd they lure the thief in - donuts? Beer?